Globalis is an interactive world atlas developed by UN Association of Norway. 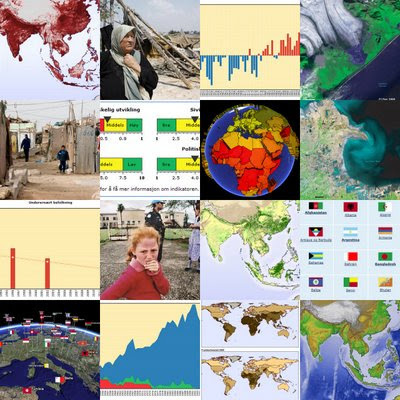 The atlas contains a large collection of international statistics, world maps (provided by GRID-Arendal), satellite imagery, country profiles and information about ongoing conflicts around the world. It is possible to do country comparsions (example 1, example 2), country rankings, and statistical maps. The atlas is currently available in Norwegian, Swedish and Danish. We are going to make most of this information available as KML files. So far you can download various KMLs to Google Earth. We are not satisfied with this solution as the KML specification has limited capabilities of controlling the Google Earth interface, and the user has to switch between two applications. I'm therefore trying to utilise the new Google Earth Plug-in. This example, based on the Earth Atlas, shows how the Google Earth Plug-in can be included in the Globalis interface. The user can switch between 5 different KMLs about cluster munitions. The map legend and description are shown separately from the KML visualisation. A missing feature is an indicator showing that a KML file is loading.